This file includes 3 pages. for practical reasons I suggest you close them as you proceed. In Europe we had to wait. The Americans already had their machines after the Korean war. They developed machines to reeducate the wounded soldiers. (The famous NAUTILUS machines, which have nothing in common with the current machines built by the same brand). You must not think either that the first machine created in France dates from the 1980's, they already existed in spas and on the large transatlantic liners. The clubs, however, only had basic equipment consisting of barbells, bars, discs and pulleys. A mere incline press was already considered as relatively sophisticated, almost a luxury! But still looking at this modern gym where "customers" or "members" train religiously and silently to the sound of soft piped music, we see that many things have disappeared. 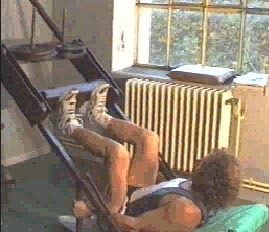 Dumbbells, barbells, discs, benches, all gone, long live the machine! Were they no good then? Were they inefficient or dangerous? If we look at the image at the top of the page and the sketch opposite, obviously there is no comparison. The machine seems to be clearly the best. Clearly, you need quite a lot of space to install it. And many more discs to load it, but what a pleasure! (take care when picking up the discs, don't damage your back getting ready to work on it! 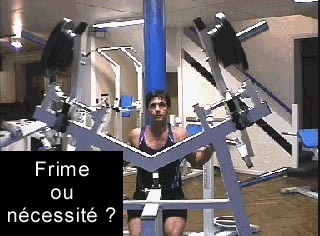 By the way, it was a dorsal machine, it is not obvious when looking at it! Men did not wait for these wonderful machines to be invented to work their dorsals. Was that little pulley any good? Did it also have advantages? That would be just too much, that progress would bring disadvantages. You might think that I am old-fashioned, embittered by life, jealous of youth!